Home » For Women	» Ladies: How Big Is Your Freedom Fund? Many Boomer women have been part of a couple for 30 or more years by now. Some may have worked outside the home; others devoted themselves to being at-home moms; and, still others chose to do both. Women are the ultimate jugglers and multi-taskers managing home, children, spouse, work, elderly parents and more! While handling their busy day-to-day lives, too many women have missed out on building their key financial skills, their credit history, their retirement savings, or set aside a substantial cash reserve…in their name! Married women need to think about themselves as individuals, not only as “the better half” of a couple. That’s because the financial world generally operates and recognizes individuals based on each unique Social Security number; and, the retirement financial view is of individuals only. So, do you know what your personal financial profile looks like from an outsider’s view? Have you done anything related to establishing your own financial freedom? More than likely, you have joint accounts with your spouse and all money is “our” money. That’s not a bad thing but it can be a problem for building a unique financial profile and record. For example, each woman needs her own solid credit history because it helps you build your financial freedom fund by securing the best credit, the lowest interest rates, and the protection you’ll need if you find yourself on your own. If you don’t have accounts, credit cards, or loans under your name, you can’t prove that you have successfully managed debt over the long term. If you don’t have certain bills and obligations under your name, you can’t demonstrate that you have successfully managed timely payments. Those are critical factors in the world of credit, loans, and personal finance. One account every woman should have is a “freedom fund”. It should be in her name only. It’s simply an individual savings or investment account at a financial institution or bank. It’s not an account that is attached to the joint checking account you and your husband or partner own. 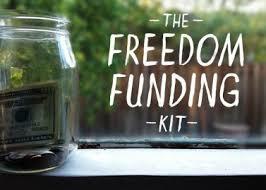 The Freedom Fund is financed over time with amounts that your household monies allow. All the decisions are made by you with no approval or veto power by your spouse or partner. So, if want a Vegas weekend with your best friends, you go. If you want that special piece of jewelry, you buy it. Your spouse/partner should also have the same type of individual account. Just be ready if he or she brings home a motorcycle with Freedom Fund money! Once you have established your account, it’s important to know that you control the assets inside and who inherits the money. To make it easier for all involved in your family finances and estate planning, be sure to set up a TOD on the account – a Transfer on Death instruction. This is different from a beneficiary form, but is equally important. How do you actually build up your fund? My husband came up with a perfect idea for me. Whenever I received a bonus from the company where I worked, that money was sent straight to “Marcia’s Freedom Fund”. It was difficult not spend the cash on a new sprinkler system, pay for day care, or reduce credit card debt…all the things we could do with that money. But, it was and still is, equally important for me to have one account outside of household obligation that gives me the freedom to splurge on myself or share with others… as I see fit. I’ve heard from other women that they collect the change from their purses and other family members’ pockets from laundry (hey, it happens!) and deposit it monthly. $100 bucks in change can add up! Others split any tax return money and invest in their Freedom Fund. Still others invest the money that the family would have spent going to dinner or save the expense of buying a new purse and then put the money in their funds. There are many ways to save. Choose what will work for you. You’ll want to answer the question, “How much do you have in your Freedom Fund?” with something more than “zero”! Get some good information about how credit works, try BetterMoneyHabits. If you are having a hard time coming up with ways to cut costs so you can save more, take a look through these 94 creative ways to save! As always, feel free to comment on what you have found successful for saving here on the blog, tweet your results @MarciaMantell, or post a note on BoomerRetirementBriefs Facebook page. One Response to Ladies: How Big Is Your Freedom Fund?